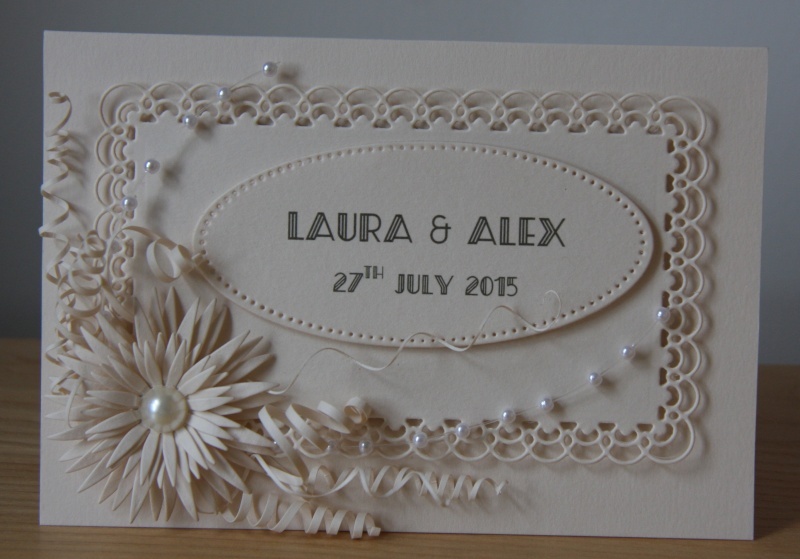 All made from offcuts of the wedding stationery. Card blank covered with a leftover piece of paper from the table-plan names; two die-cuts cut from the first invitation we received (the one which had got smashed up in the post - they sent us a replacement); flower die-cut from one of the table number cards where the printing went wrong; spirals from off-cuts where I'd trimmed pieces of card. Even the pearl sprays are re-used: were in the decoration I made for Mum's 80th birthday cake. The pearl in the centre of the flower is new, though! That's beautiful Lynda, well done on all the recycling too! Fab, and very special with the bits you have used. Well done. That's totally gorgeous, Lynda. I LOVE that flower and the curly bits. That's really lovely Lynda and a great idea for leftovers. Very classy, liking those spirals particularly. This is superb and will really stand out against the mass produced ones they receive. Really beautiful card, love the white on white. Ooh - I don't think I've been Pinterested before, Ruth!